EATON — According to Fair Manager Jim Shute, the 168th edition of the Preble County Fair was a success. Shute gave his report to the Preble County Commissioners on Monday, Aug. 20. He shared, attendance actually broke a record on opening day. 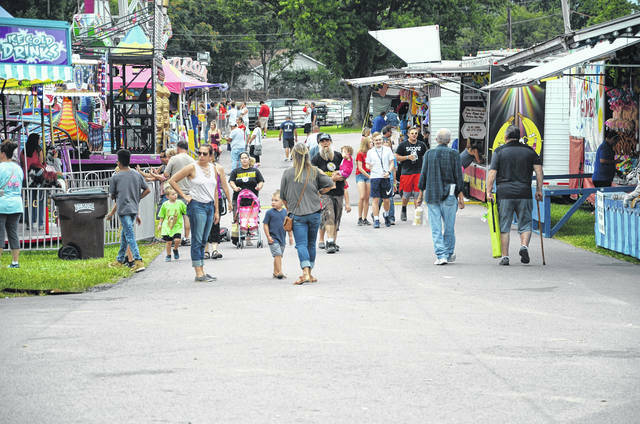 It was, at least, the most well-attended Saturday of the fair in the last five years. The only snag was an electricity blackout on Wednesday of fair week. Officials did have insurance companies come in, who determined the transformer in the infield is originally what blew — which caused the lights to blow and burn. It blew right under the parking lot of the new building. The fair board is waiting for a quote from Garber Electric to replace the transformer and fix any damage done. The Fair Board recently held its first meeting since the fair took place. “They had a meeting last Thursday, we talked about the sale, and there were a lot of concerns about that. Of course, the 10 people who show up are upset about it, but the other 50 were happy with it,” Shute said. “It was over by 2:30 p.m. I didn’t bring my paper with me, but when the money came out it was about the same. The only thing that was down was the cattle. Fair Board President Clinnie Stevenson asked the commissioners if there was any delay on installing the Expo Addition restrooms, because he had heard a rumor circling they could not be installed until after June of next year. Commissioners responded, that is false and they are trying to complete the Expo Addition restrooms as soon as possible. They will start work on the project as soon as the money to pay for it has been raised. The bathrooms in the Expo Addition are actually one of Shute’s biggest priorities — as far as fairground renovations go. “I know there is also a group that wants to get the produce building fixed up, which is great, I love that old building and don’t want it torn down, but I think we need to be conservative where we go. We need to get the bathrooms done, then we can fix up the produce building. I know everyone wants it done right away, but it is going to be a costly project,” he said. Stevenson then brought up the need for a permanent building for the Junior Fair Board. Commissioner Denise Robertson replied, she heard they are currently in search of a private donor to fund a new building similar to the new office building complex.